Blur would be the best description! I am so glad it is Friday! Our missions newsletter was finally completed, copied, folded, stuffed, stamped and mailed! (E-mailed to those with that capability). That was a feat in and of itself! The pipe is busted under the house (which explains the rancid smell drifting into the dryer through the vent!). It is being fixed as I type but the last two days have been interesting with minimal dishes and no laundry! My blog couldn't be updated yesterday because Blogger was working on... something? Perhaps God's way of saying to take a day off! As crazy as it all sounds, it was a blessed week topped off with a surprise visit from some friends I haven't seen since we moved. I so enjoyed chatting with them today and hope, now that they found us, we may see them more! Boy am I going to sleep good tonight! Mobile and last minute.... I had all of their lesson plans drawn up but my grading was slow this week and most mornings, after Bible study, were spent grading and re-situating their folders for that day's work. I felt bad because it caused us to lag a bit each morning, but we did get off the ground and get all our work done. However, this is not a habit I want to keep! Brooke is getting better at remembering to borrow and carry. Brenden's scale back from 3-digit division to 2-digit division helped him move forward with more success. I think I will start re-introducing 3-digit division next week now that he has a better grasp of the other. Ashley started a three week research project through her Language Arts program. She chose Barn Owls for her focus and has really sunk her teeth into the research! I was concerned she would complain... but she hasn't! I'm so proud of her! "We" not as much as "I" have places to go plans and I am excited! I have been invited to go see a "real" play at a "real" playhouse tonight!!! I haven't been to a non-kid-non-elementary play in a long time! Also, this time next week I probably won't be here.... like my day with God last year and during my morning with Him last week, I was called to something big and wonderful: a whole weekend with God next week. I am prayerfully considering where and I am excited to see what He wishes to show me. I do feel God and I will be getting some work done and I look forward to sharing what He shows me and what We accomplish! Being able to go to storage! Not having a car made that a difficult task. But the weather was lovely, the kids packed lunches and schoolwork and it was simply lovely to get to the things they have been needing... like sandals and clothes that fit! What is not working is prepping their folders in the morning! Must get back in the habit of doing that at night. What is working is being willing to scale back on things that are too much too soon... regardless of what my lesson plans say! Sometimes it is hard to let go and step back when you have been doing so good moving forward... or when you just want to reach a goal! But some goals take longer than planned and doing them in the right time, God's time, always produces the best results along the way and at the finish line! 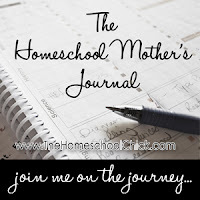 I really need to go through my curriculum and get things together to put in the Homeschool Association's sale on 6/5! And I need to prayerfully consider what Math curriculum I want to look for! I came to the realization/conclusion this week that Brenden may have a mild case of Cerebral Palsy. On top of his other learning curves, I plan to do some research this summer to see what would be the best approach for his/our situation. He has been moving forward this year (praise God) but I wonder how much forward he should be at this point and if there is anything more I can/should be doing to help him be successful, not just now, but in life as a whole. I am eternally grateful that the longer we homeschool the better we get at following God's lead in all we do. Because of this, I find myself considering all of the above with excited anticipation. I wonder, "what wonderful places will we find ourselves in next?" Brenden learned to mow the lawn for the first time this week! He loved it and did a great job. May all your homeschool memories this week be lovely from the busy to the quiet, from the complex to the simple... and everywhere in-between!